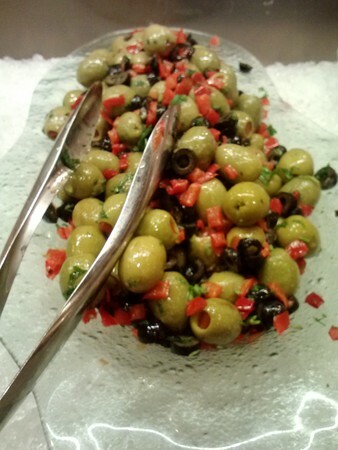 MGM’s Grand Buffet captures the decadence and glamour of Las Vegas, serving up generous portions of both daily. Breakfast stations run the gamut from the Heart-Healthy Station with fruit compotes and yogurts to the more indulgent offerings like honey-baked ham, smoked salmon, and made-to-order omelets. Prices and hours vary depending on which day of the week it is. Monday through Friday, is served from 6:00 a.m. until 10:00 a.m. for $17.25 per adult and $11.99 per child between 4 and 12. On weekends from 6:00 a.m. until 9:00 a.m., the price jumps to $18.25 for adults but remains the same for children. Brunch offers a similar variety for the price of $19.99 Monday through Friday and $25.99 on weekends. For children the price is $14.99. The hours vary as well, with the Grand Buffet running brunch service from 10:00 a.m. to 3:00 p.m. on weekdays, yet opening earlier at 9:00 a.m. on weekends. Spend a meal with the Grand Buffet team and you are in for a treat. Dinner features a staggering display of delicacies like Alaskan Crab Legs, Roast Prime Rib, and Grilled Marinated Beef Kabobs that are sure to satisfy the palate and appetite. 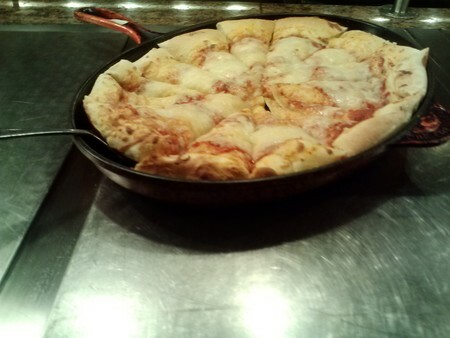 Dinner is available nightly from 4:00 p.m. to 8:30 p.m. for the price of $29.99 during the week and $35.99 on Saturday. The cost for children is $19.99. 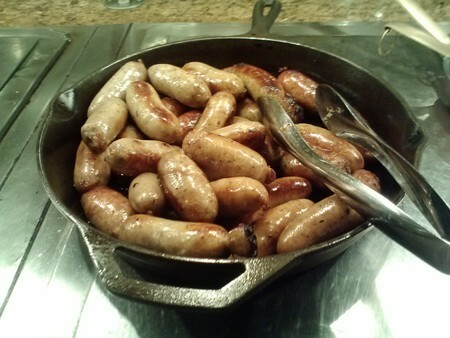 On a brisk Thursday morning, just before 9:00 in the morning, a friend and I make our way through the casino floor of the MGM Grand in search of a fulfilling breakfast. There are plenty of signs leading the way to the hotel’s Grand Buffet from the self-park garage, and it takes us about ten minutes to walk from the truck to the restaurant. Lucky for us, there is only a short line when we arrive. After another ten minutes, we have paid and we are on our way to a table, being lead by one of the smiling hostesses. As we walk through the large, open dining room, I take a moment to admire the lay-out and the décor of the notorious MGM Grand Buffet. Large stone pillars and heavy granite tabletops along with rows of green foliage tucked into beds of smooth, black cobble stones give the space a very natural feel. 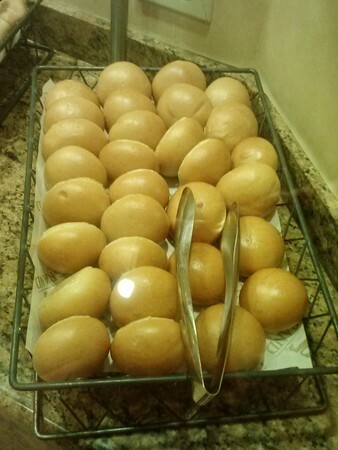 Food stations surround the dining space with various access points offering a great assortment of omelets and fresh eggs prepared to order, baked pastries like scones, muffins, Danishes, and fresh donuts. There are also hot and cold cereals as well as other heart-healthy options like house-made yogurts, granola, and fresh seasoned fruit for those seeking an alternative to heavier items like assorted bagels, fresh carved ham and Portuguese sausage. 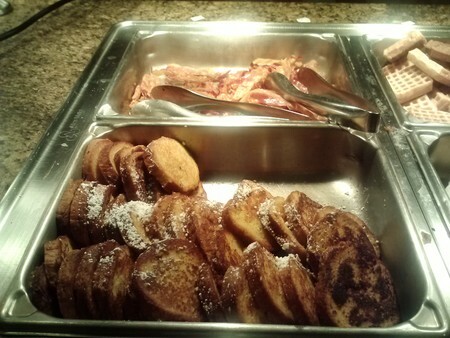 All of the typical breakfast favorites can also be found with Belgian waffles, cheese blintzes, pancakes and mini French toast, and other hot specialty entrees, fine aged Italian meats and cheeses, fresh-baked cinnamon rolls, apple turnovers and cherry turnovers offer a bit of diversity to the regular morning dietary routine. The line-up allows foot traffic to flow easily, and the placement of the different types of food is practical and efficient. Monday through Friday, breakfast is available from 7:00 a.m. to 10:00 a.m. for the price of $17.25 per person and brunch continues from 10:00 a.m. until 4:00 p.m. at 19.99 per person. Weekend Champagne Brunch is served from 9:00 a.m. to 4:00 p.m. at $25.99. 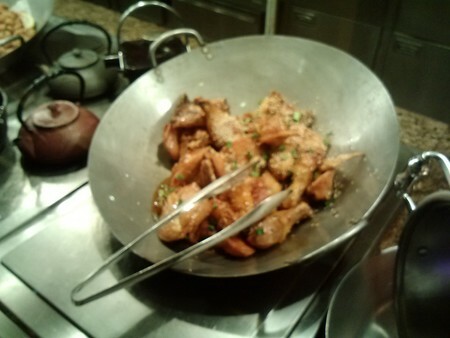 Dinner is a nightly event served from 4:30 p.m. to 9:30 p.m. The price is $29.99 Sunday through Thursday and $32.99 Friday and Saturday for the Seafood Dinner. This is a casual affair and children are more than welcome for discounted prices. With the weekday breakfast in full swing, my friend and I waste no time. Our server stops by our table briefly and takes our drink orders. We both decide to start with orange juice, coffee, and water. As she walks away, we grab our plates and head to the “beginning” of the buffet. 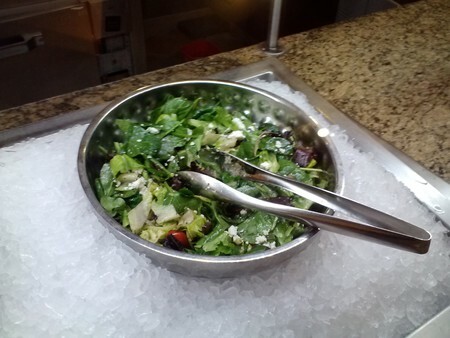 The food is displayed in either free-standing bar stations or active preparation stations where there is a team of staff cranking out fresh food like a well-oiled machine. 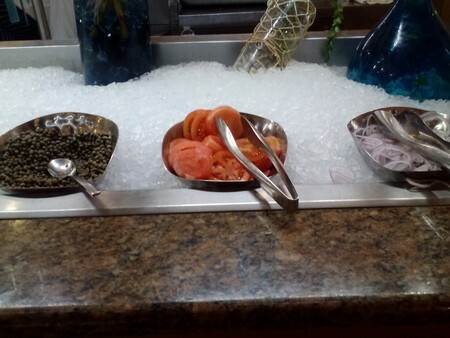 Just left of the entrance to the buffet, several dual-sided bars are lined up in rows featuring fresh salads with numerous toppings and dressings, iced seafood, fresh fruit, and yogurt, as well as other traditional hot breakfast items and specialty dishes. 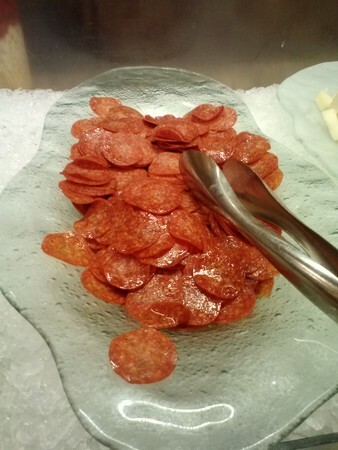 I am also pleasantly surprised to find a couple of fresh Italian cold cuts and generous cubes of fresh provolone cheese, but I wish there were more options to choose from, especially with regards to the cheese. I comprise my first plate of smoked salmon, smoked trout, fresh pineapple, spicy pepperoni, a bit of capricola, and some provolone cheese. 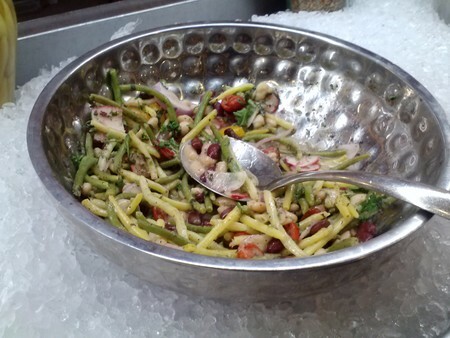 The smoked fish is portioned into small bite-size cuts, perfect for just a taste of the raw smoky flavor. The salmon is good, but the trout is a bit on the slimy side and extremely fishy. From here I move to my cheese and cold cuts. 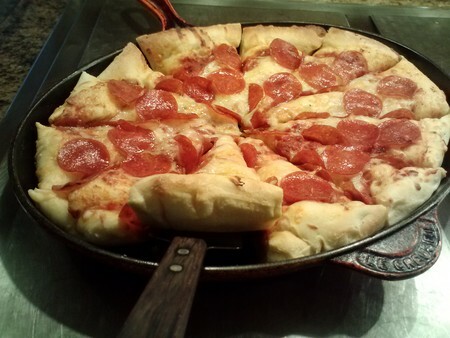 The pepperoni has a strong kick that lingers until a bite of provolone overpowers the meat. The capricola is perfectly cured, not too dry, and very thinly sliced. 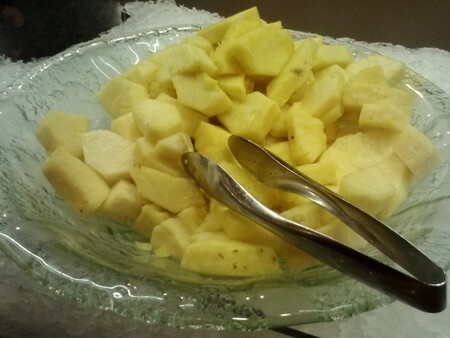 I finish out my first round with a juicy mouthful of sweet, ripe pineapple, lending a tart acidic ending to a plate full of bold flavors, and then I head back for more. 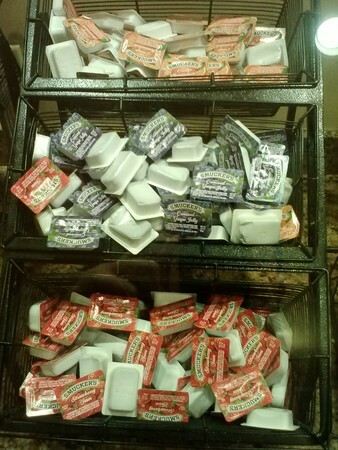 I make a trip through the active stations where classic breakfast delights abound. 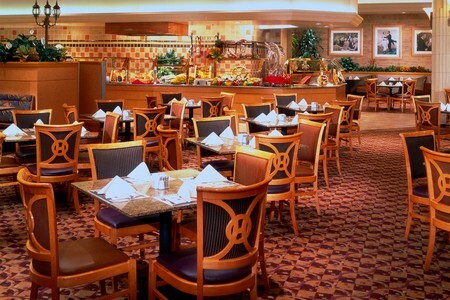 The food stations occupy the majority of the restaurant’s back wall and surround the centralized dining room. 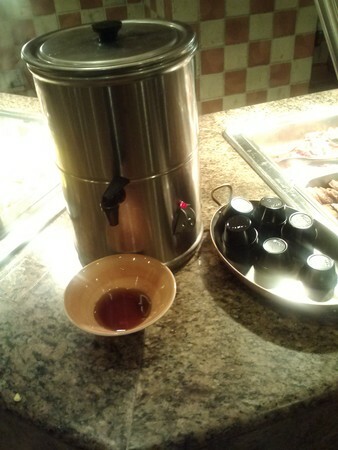 This set up makes navigating the buffet simple. Just pick a side to begin, then work your way around, picking and choosing anything that catches your eye. 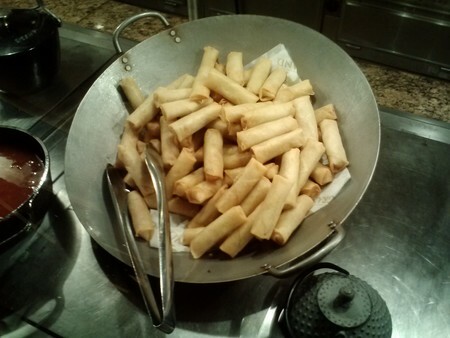 The left end is where I begin; this time I am not looking for light appetizers. After one pass, my plate is loaded with hot bacon, country potatoes, scrambled eggs, summer sausage, beef hash, apple sausage, a cheese blintz, a peach blintz and last but not least, a freshly baked sticky bun. My bacon is crispy but not burnt, and although there is not much grease to be seen, the meat is very flavorful with hints of smoked apple wood. The potatoes are lacking in the seasoning department, but they are cooked well; they are crispy outside with a hot buttery interior. Similar to the potatoes, my scrambled eggs require ample salt and pepper, and sadly the consistency would suggest that they are either overcooked or made from a powder. 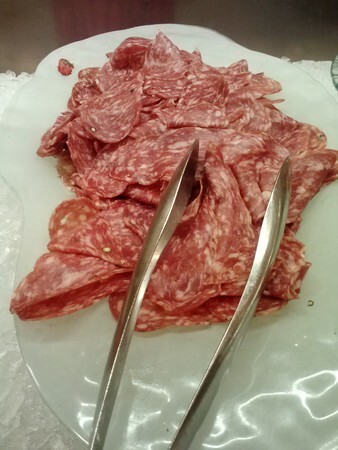 The summer sausage is good quality, slightly spicy and carved fresh. The apple sausage pales in comparison to the carved summer sausage, and it seems overcooked, as if heated in a microwave. I move on to the sweet half of my plate and take a large bite of the warm, sweet sticky bun. 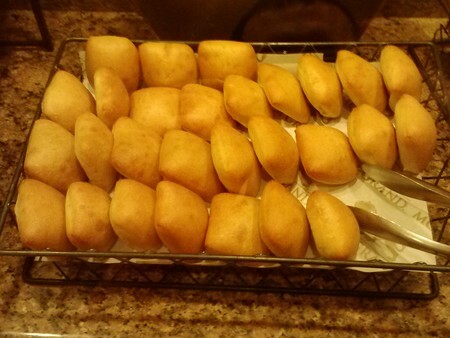 The bread is dense and chewy, and the frosting is pure sugar. My peach blintz bursts open with sweet slices of peaches and thick compote with hints of cinnamon and brown sugar. However, the cheese blintz comes across very plain and slightly lackluster. Of the two, I certainly favor the peach. To wash it all down, I sit for a moment and enjoy my coffee. It is served piping hot and is one of many options including black tea, chamomile tea, green tea and mint tea as well as assorted juices and sodas. My coffee is a medium roast and very fragrant. I am glad to find quality coffee like this when I visit a breakfast buffet since it is such an essential part of my morning routine. I finish the cup, but I haven’t seen our server in quite some time. I wait a few minutes hoping for a fresh cup, but with both coffee and orange juice still empty and used plates at the edge of the table, I return to the line. 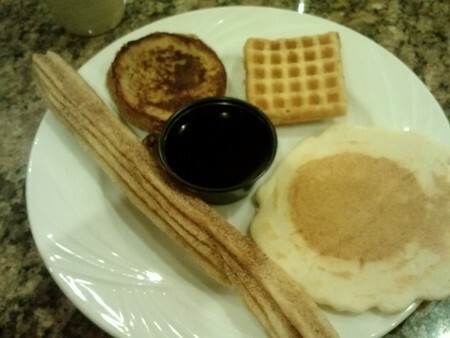 This time around, I test the skills of the resident omelet cook, and then I begin to fill the remaining space on my plate with a churro, mini-waffle, mini-French toast, and a mini-pancake. I top each griddle item with butter and hot maple syrup and turn back with no room on my plate for more. I am relieved to find my table now cleared of old plates, however my coffee and juice remain empty. Before I begin eating, I catch the attention of a nearby staff member, and although she is not our server, she is happy to oblige my request for fresh coffee and juice. 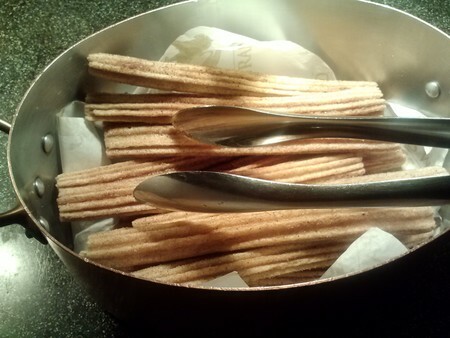 I begin eating once more and find my churro to be quite a letdown. The bread is dry and it stands in need of much more cinnamon-sugar, but fortunately, the mini-waffle somewhat makes up for my initial disappointment. 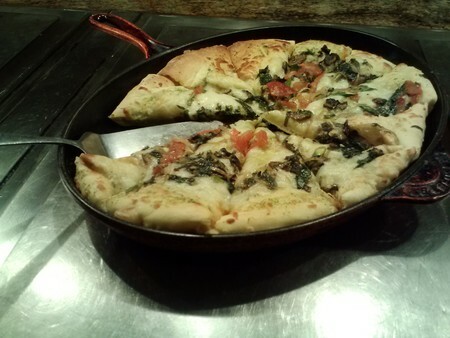 The outer crust is crispy and golden brown, while the thick breading inside is light and fluffy. With the addition of hot maple syrup, it is a picture-perfect, snack-size version of a fresh Belgian waffle. The French toast is also a hit, served as small circular slices that are thick and chewy. 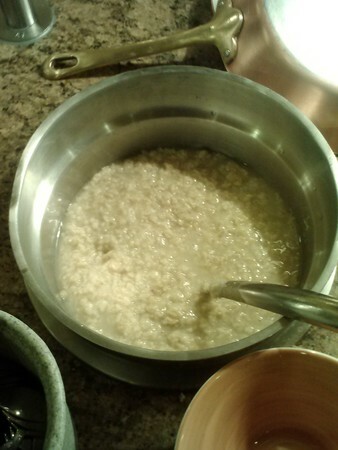 The bread is absorbent and flavored with hints of cinnamon, making the hot maple syrup a perfect complementing topping. The pancake, though slightly dry, is also good when smothered in plenty of syrup, but certainly not a memorable item at this buffet. 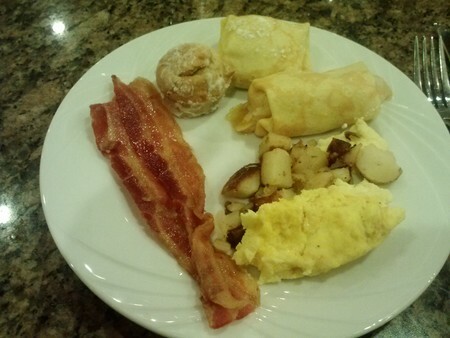 The true highlight of my plate is the omelet, which happens to be the chef’s specialty. He calls it the Eggs Benedict Omelet with ham, hollandaise sauce, and a separate poached egg wrapped inside of a fluffy omelet. 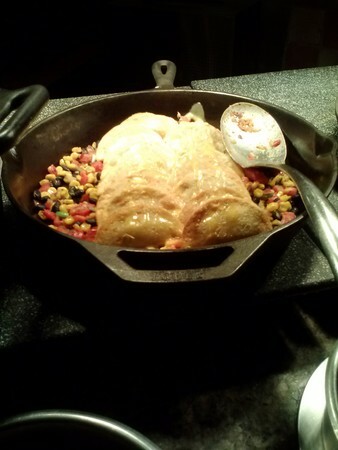 He has been making omelets at the MGM Grand Buffet for ten years and says that this is his all time favorite experiment. The poached egg breaks open as I cut into it, casting thick, savory yolk over the whole concoction. The creamy hollandaise and sweet, salty cubes of cured ham bring the dish full-circle making the omelet taste exactly like traditional eggs Benedict. It is always uplifting to see staff members who stay with the restaurant long enough to master their trade the way that this cheerful omelet chef has done. Nearing the max fill point, I decide to go for just one more plate of food before I hit the desserts. I stop at the carving station for a thick slice of orange-glazed ham before snagging a hand-made biscuit. 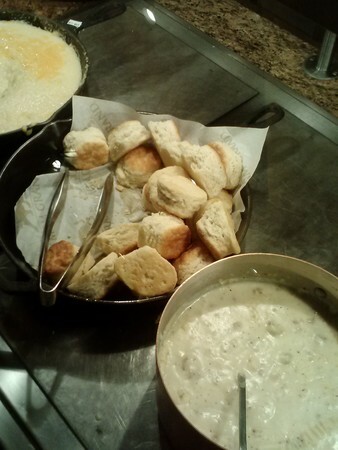 I halve the biscuit and pour a generous helping of steaming country gravy over-top. 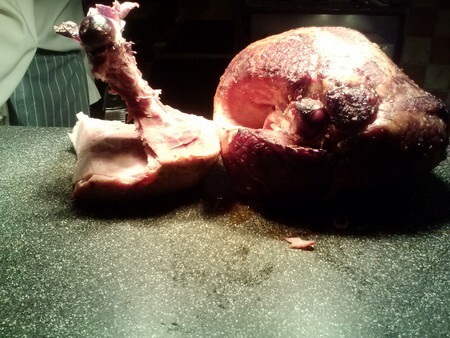 The ham is definitely slow-cooked, indicated by the tender, juicy meat. The outer skin is caramelized, sealing in the natural flavors of the pork, thusly providing a distinct smoky flavor with hints of sweet citrus. The biscuit is dense and buttery. It absorbs the creamy, peppery gravy and each bite is bursting with flavor. At this point, though the dessert bar still awaits us, I am unsure if I can continue. After a few moments of rest and another fresh cup of coffee, I stop kidding myself and hurry off to sample the sweeter side of this buffet. 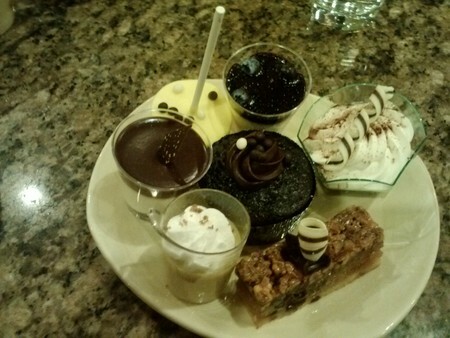 Of all the different sections, it is the extensive dessert bar that I find most impressive. One interesting and commendable aspect of the station is an entire section of sugar-free desserts. Being a bit of a sugar-free skeptic, I consider avoiding this section altogether, but for the sake of experimentation, I choose to try a few. 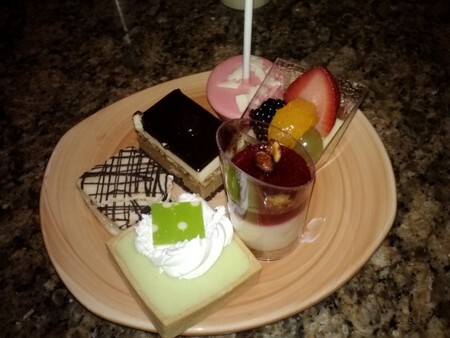 Because the plates provided for dessert are a bit small, I take two, and make my way down the line. Ultimately I end up with a strawberry cheesecake pop, a lemon cheesecake pop, a key lime tart, tiramisu, chocolate cake, a pecan bar, lemon panna cotta, fresh fruit crème brulee, an espresso bar, a s’more, a pb& j cup, and lastly, chocolate cheesecake. 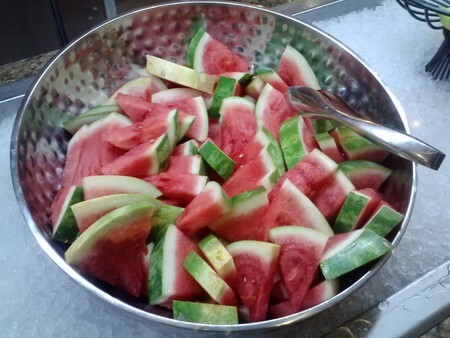 It seems I have eyes slightly bigger than my stomach, but I do not hesitate to give my best effort to try them all. The highlights of the bunch are definitely the strawberry cheesecake pop and the chocolate cake. The cheesecake is thick and creamy with a firm strawberry frosting. It tastes great and the lollipop presentation is a definite crowd pleaser. The chocolate cake is portioned well. It is dense, moist and super rich. Aside from these two immediate favorites, I also thoroughly enjoy the espresso bar, with five delicate layers topped with cocoa and garnished with a single coffee bean. 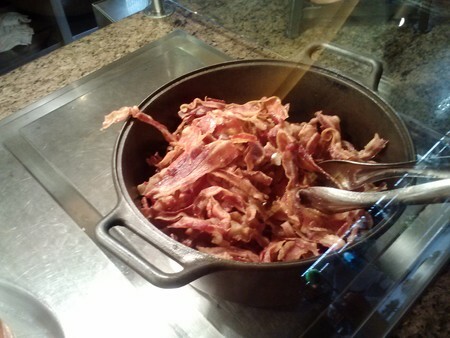 Overall, I must say that the MGM Grand Buffet offers Vegas-goers a decent value for a hearty breakfast. It is simple to follow the signs from the parking garages and through the casinos that lead to the entrance, involving about ten minutes of walking. The entry line can be lengthy at times, but it only takes us ten minutes total, and at $19.99 per person, it isn’t the cheapest buffet on the block, but it certainly isn’t outrageously high for Las Vegas. Our server is quick out of the gate, but overall misses a few key points with the coffee refills and plate clearing. The table settings are satisfactory, with average flatware, but the ambience of the dining space is calming, and the décor provides a natural, open feeling. 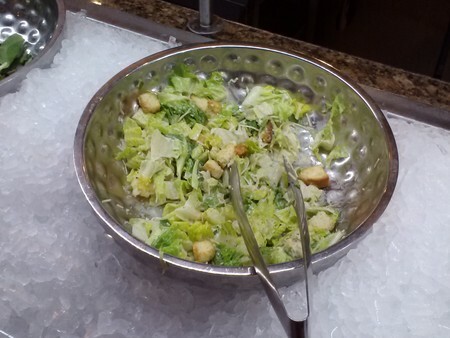 The food selection definitely covers the traditional breakfast basics, but overall the selections are not as broad as some large scale buffets. Points are definitely given for the quality of the food though, with only a few items falling short of satisfactory. 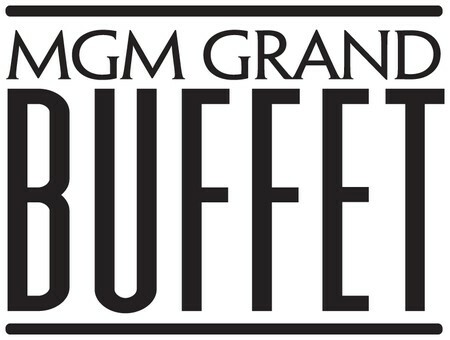 Ultimately, my friend and I leave with bellies full and hunger satiated, without taking too much of a financial hit, and should I find myself a guest of the MGM Grand in the future, I will certainly visit the Grand Buffet a second time. | Breakfast 6 a.m. - 10 a.m.
| Dinner 4 p.m. - 8:30 p.m.
| Brunch 10 a.m. - 4 p.m.
| Dinner 4 p.m. - 8:30 a.m.
| Brunch 9 a.m. - 4 p.m.
| Breakfast 6 a.m. - 9 a.m. Does your Sunday Brunch include unlimited champagne? What is the cost per adult? Yes, the Sunday Brunch does include unlimited Champagne. The cost is $23.13 (plus tax) This is the price with or without Champagne. Saturday and Sunday only. Price does not include alcoholic beverages, tax or gratuity. Friday and Saturday only. Price does not include alcoholic beverages, tax or gratuity. 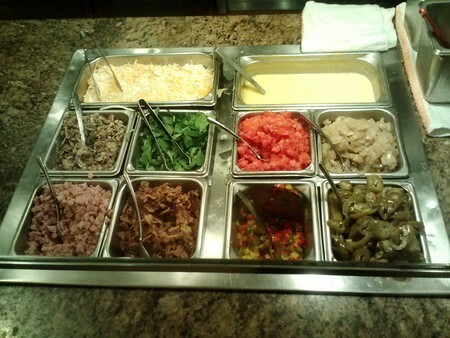 I'm not much into buffets except when it comes to brunch. 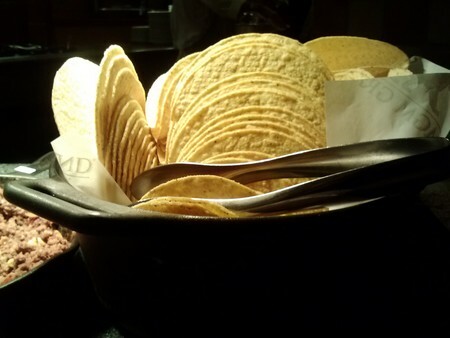 The MGM Grand Buffet has one of the best on the strip. 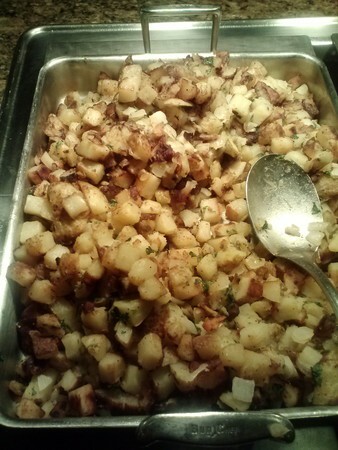 I've had brunch there several time and the food always tastes fresh (unusual for a buffet). The only downside is the seating area is a little old and dreary looking, could use some renovations. 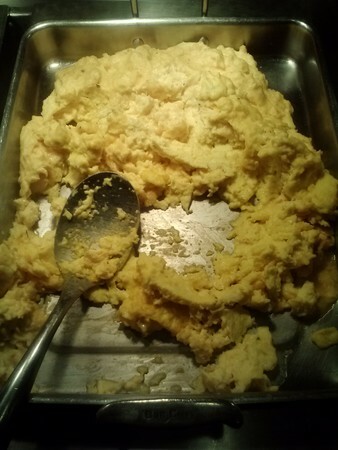 I was terribly disappointed in the buffet. We went there last weekend with family out of town and wanted something special. The price was high and the food very mediocre. Something I would expect in a not so nice hotel. Maybe the economy has to do with the quality of their food. Never again! 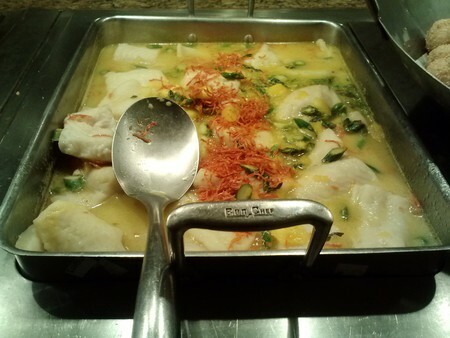 Terrible Experience in Grand Buffet. Stay Away! 2nd visit to this Grand buffet this year after the CES show. Going there alone by myself, waiter directed me to the right hand side table. Talked with a male waiter to order an ice tea, it's totally being ignored for 10 min. Then another lady come to me if I have ordered any drink. I told her I told their other guy. She's like staring at the guy. Then she said she will bring it to me. Thank her so much. First round, king crab legs, first bite, oh man sand inside. Second round, a roast beef. The chief hand me the roast beef like I had killed his motherboard. Hey, I did ask him politely. However, the roast beef taste extremely salty. I could still eat a solid salt on it. Third round, ate the BBQ ribs, damn, it had the stinky pig hormone smell, I spit it out right away. Food selection is not so great. If you want fired chicken and pasta, it will be a nice place. Anyway, the good area was the desserts section that offered you a wide variety of desserts. Overall experience is not so good, but I still offer them tips. But just don't understand how waiter can treat their customers like that. Terrible! Stay away.